Senior CPM leader Sitaram Yechury meeting children on his arrival at the airport in Visakhapatnam on Monday for the party's 21st national conference. Photograph: PTI. 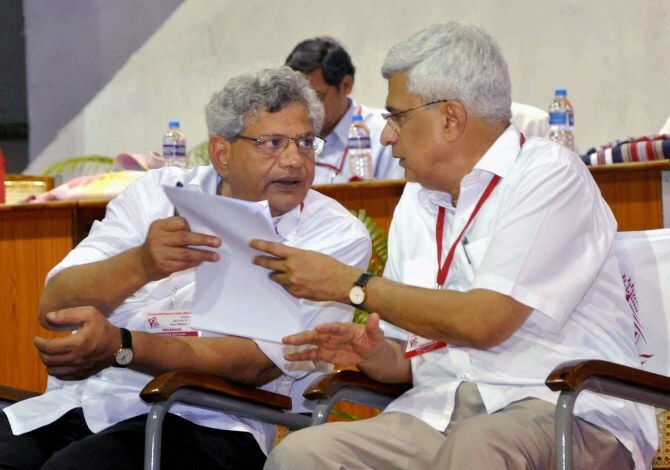 One of the most recognisable faces of the Communist Party of India-Marxist, Sitaram Yechury has the image of being a pragmatic leader unlike his predecessor Prakash Karat, who was a stickler to dogma. An outstanding student, the Politburo member has emerged as a leader with considerable skills of political negotiations who has friends across the spectrum. Yechury, 62, who was elected as the CPI-M general secretary at the party's 21st Congress in Visakhapatnam today, is cast much in the mould of the late party leader Harkishan Singh Surjeet. Yechury had learnt the ropes under Surjeet, who had played major roles in the coalition era governance first during the National Front government of V P Singh and the United Front government of 1996-97, both of which the CPI-M had supported from outside. Visakhapatnam : CPI(M) Former general secretary Prakash Karat and Yechury at the party's 21st National Congress in Visakhapatnam. Photograph: PTI. Yechury further honed his skills when the Left parties backed the first United Progressive Alliance government often putting pressure on the Congress-led regime in policy-making. He had also played a critical role in the talks with the government on the Indo-United States nuclear deal that led to the Left parties withdrawing support to the UPA-I government because of Karat's stubborn stand. There are analysts who feel that the Left parties including the CPI-M pushed themselves into a corner, from which it has not been able to recover in successive elections. Born on August 12, 1952, Yechury completed school education from Hyderabad and moved to Delhi to complete his graduation in Economics from St Stephen's College, standing first class first. He did his post-graduation from Jawaharlal Nehru University again with a first class, but could not complete his Ph.D degree due to his arrest during Emergency, after having remained underground for some time and organising resistance. After his release, he got elected as President of the JNU Students' Union thrice. In the SFI, he became the all-India joint secretary in 1978 and its President soon thereafter. In 1985, Yechury was elected as a member of the Central Committee of the CPI-M and then to the Politburo in 1992. He has also headed the party's international department and been the editor of the party organ 'People's Democracy' for a long time. With his radical views, he played a crucial role in convincing the leaders of the Maoist party in Nepal to join the political mainstream there, using his contacts of the student days. Yechury was elected to Rajya Sabha in July 2005. His powerful speeches in the Rajya Sabha on issues ranging from the plight of the peasantry and the working people and the government's economic and foreign policies to the growing threat of communalism, have won much acclaim. He was also the erstwhile chairman of the parliamentary standing committee on transport, tourism and culture which brought out several reports on crucial issues. Yechury is married to a journalist and has a daughter and a son from his first marriage.